Newswatch: Is Britain now a Disunited Kingdom? 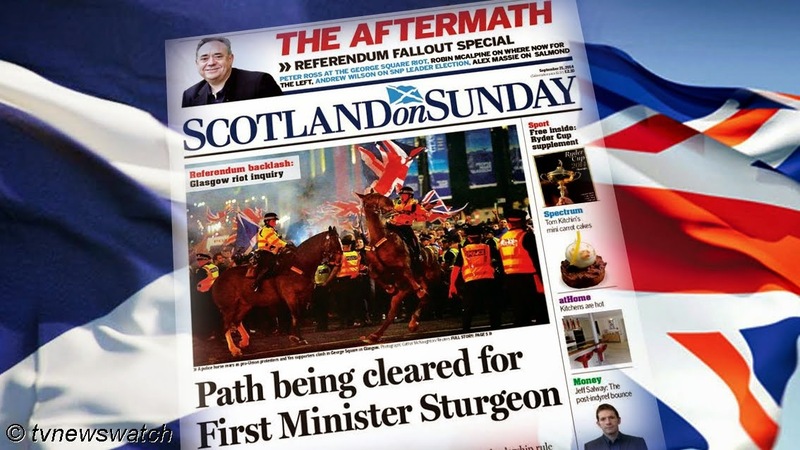 The violent scenes in Glasgow on Friday night between Yes and No supporters may have been isolated, but they point to the clear divisions that have been stirred up by the Scottish independence debate and referendum. Unionists flooded parts of Glasgow on Friday evening taunting and jeering nationalists who they saw as traitors to Britain. Some protesters, draped in the union flag, were seen making Nazi-style salutes whilst shouting chants of "England". However the images that will be seen around the world will be uncomfortable for Westminster who would prefer that the decisive No vote showed there was a clear mandate that the people of Scotland wished to remain a part of the Union. In fact only a little over half the the people of Scotland voted to remain part of the UK, and many say they were pushed towards voting no to independence because of the scaremongering in the last few days of the campaign. The No vote defeated the Yes vote in Thursday's referendum by 2,001,926 to 1,617,989, a national split of 55% to 45%. There have also been accusations of vote rigging and electoral fraud though it is unclear whether these cases will be investigated or if they played any significant part in the process [BBC / Sky News / Daily Mail / Metro / Guardian / RIA - Russian]. What is clear, is that Scotland is deeply divided. Many who voted no, have expressed a desire to have gone the other way but felt some fundamental questions, particularly about currency and finance, had not been addressed by the Yes campaign. As first minister Alex Salmond announced his intention to step down on Friday he said the campaign for independence would continue and "the dream shall never die" [BBC / BBC]. But for millions of Scots, the decades ahead may prove to be more a nightmare. Many may also ponder the question "What if?". The younger generation, particularly, may feel aggrieved. Statistics showed that younger people were more likely to have voted Yes whilst older people voted No [Guardian]. There were also clear geographical divisions too with some parts of the country leaning more towards the No camp than others [BBC]. Back in Westminster, the No vote brought cheers with promises that there would be political reforms and changes to the way both Scotland and the rest of Great Britain was to be governed. But less than two days later there were already signs of divisions in parliament as leaders on both sides disagreed with each other. Labour party leader Ed Miliband signalled he would not sign up to Prime Minister David Cameron's plan for a new UK-wide devolution settlement in the wake of the Scottish referendum. Cameron wants enhanced powers for the Scottish Parliament and new powers for English MPs at Westminster agreed, in draft, before the 2015 election. However, Miliband wants a "constitutional convention" after the election to discuss devolution plans for England. One reason he is reticent to discuss English devolution and address the West Lothian question is that Labour might also lose some sway in the Commons [BBC / Telegraph / Guardian / Telegraph]. As for the people of England, opinions vary widely. Some have expressed disappointment at the No vote, hoping to be rid of the Scots that they see as a drain on English taxes. Most people in England overwhelmingly reject the Scottish Government's claim that independence would have improved relations between the two countries, with only 10% believing that it would. However, surveys carried out a month before the referendum showed that English people wanted a much tougher stance on Scotland if it decided to say in the Union. Some 56% of those polled said that public spending in Scotland should be reduced to the UK average following a No vote, while 63% believed that Scottish MPs should be prevented from voting on English laws, a clear indication that many felt the West Lothian question should be tackled. For some English people feelings are less strong. "It's a matter for the Scots," said one shopper on Saturday, "I'm just glad it's all over." If only she were right.